I love my hand knitted socks. My Mum has knitted them for me for years now, always using good quality wool or wool blend yarn. I have many pairs, all cherished. 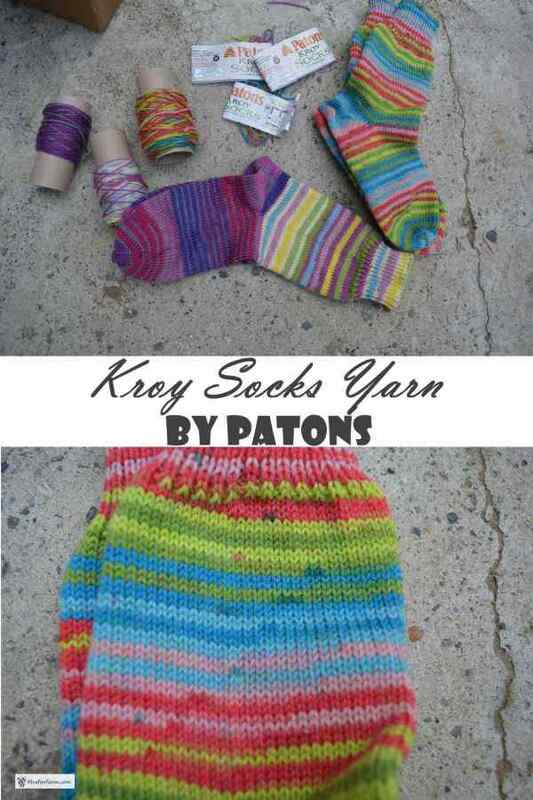 This review is one that I was asked to do to compare the yarn found here. As you can see, there are lots of different colours to choose from, and I was really torn. Two balls of each will make a pair of socks, so I chose two colours; Meadow Stripes, and Purple Haze. As it turned out, they sent only one ball of Purple Haze, substituting the second ball with Sweet Stripes after my okaying the decision. 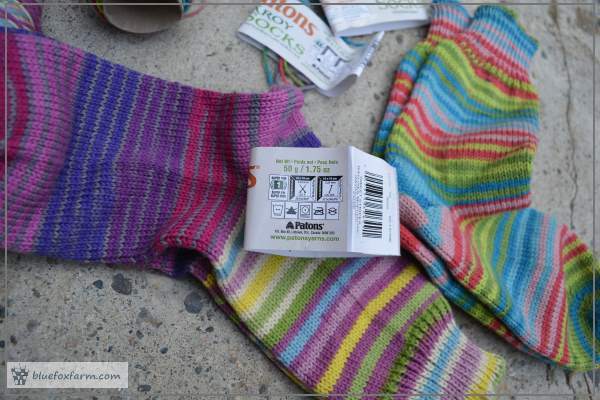 After a short discussion, we chose to knit half of each sock starting with the Sweet Stripes, leaving Purple Haze for the foot section. If I was to choose some for my husband, I would go for ones that are much more subtle! 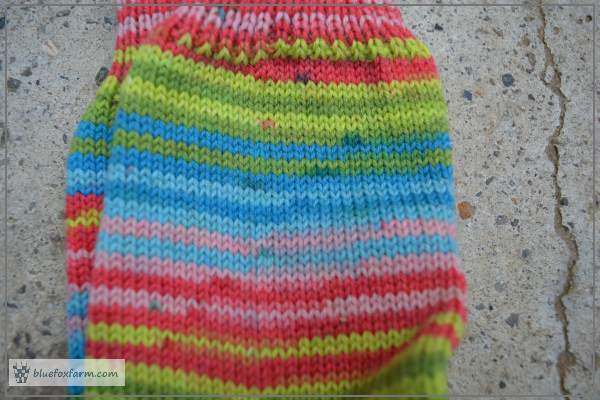 He likes the hand knitted socks too, but is reluctant to wear the brightly colored ones. 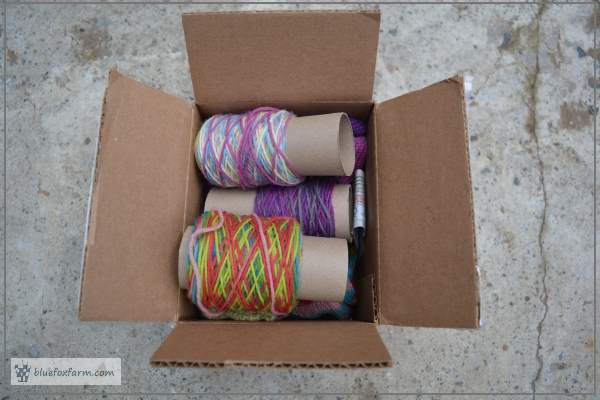 I had four balls of the yarn sent directly to Joyce to be knitted. She uses a machine to knit the rib part in one straight strip, but then transfers half of it to each bed to continue to knit the ankle and foot part in the round. The only part that requires sewing is the few inches of rib at the top, and a few stitches at the toe. The rest of it, heel and everything, is shaped to fit by means of an intricate method of holding some stitches. I'm anticipating getting a lot of wear out of these socks, because of the small amount of nylon that the yarn contains. That always gives it more strength. The wool will make them warm to wear in all weathers, including spring and fall. I routinely wear only one pair of socks inside my boots for winter, and it's more than adequately warm. I always hand wash or machine wash and hang to dry. Although I've seen warranty indicating the socks will be fine to put in the dryer, I'm dubious and I don't take any chances. Edited to add; I've washed my socks in the washing machine on the delicate cycle with no adverse effects. As they were a little large at the start, shrinking them a tiny bit made them fit that much better - no felting was visible, just slightly tighter tension in the knitting.